Although I enjoy salads, sometimes when it is really cold, I do not like to put cold food into my body! Shivering is not on the menu! So, sometimes a warm salad is just the thing for dinner. The smokiness from the paprika and the sweetness of the roasted vegetables are a nice contrast to the freshness of the parsley and lemon. 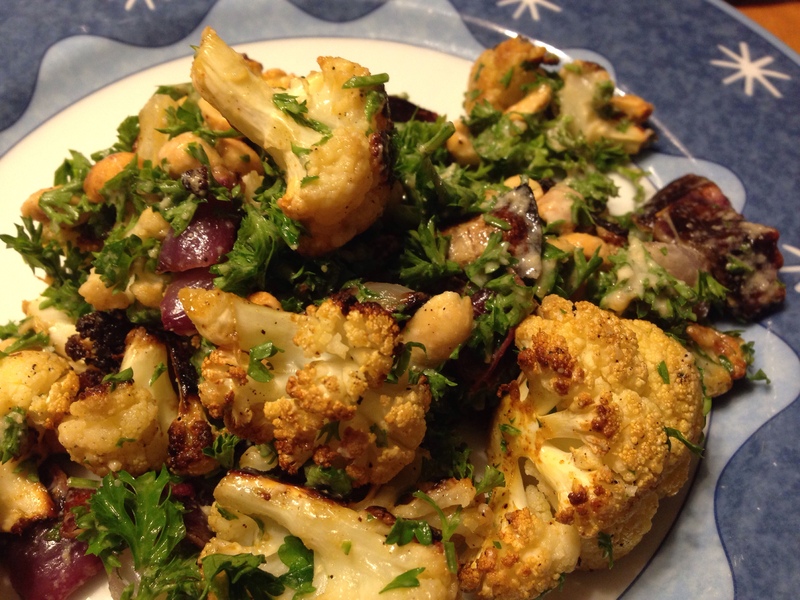 *Use less salt than you normally might when roasting the cauliflower, as the peanuts you add later will add some saltiness. 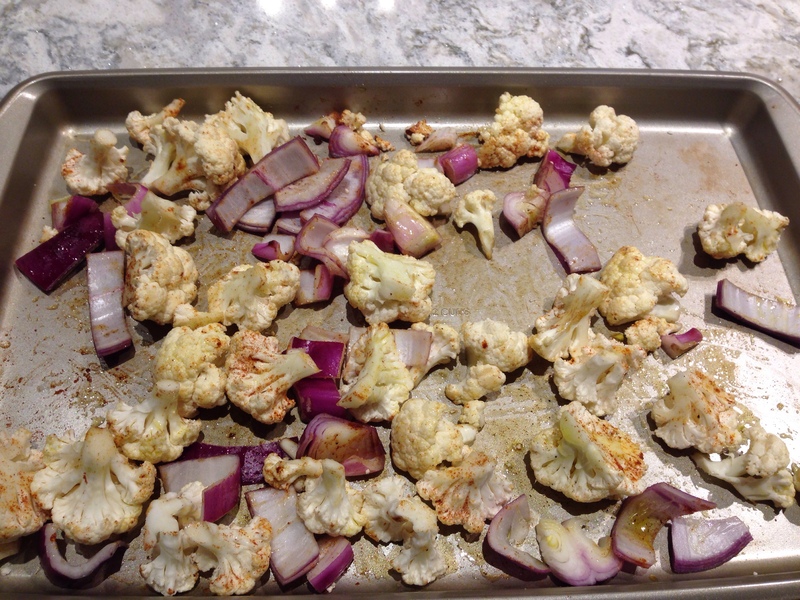 Place cauliflower and onion on a baking sheet, drizzle with oil and sprinkle wit paprika, garlic and pepper. Using your hands, move the vegetables around, ensuring the oil and spices get distributed. Roast in a preheated 400 degree F oven for 15 minutes. Stir, and roast another 15 minutes. I like to pile the onions on top of the cauliflower for the last bit of time so they don’t get too dark. Heat the tahini, lemon juice and water until warm. (I do about a minute in the microwave). Whisk until homogenous. 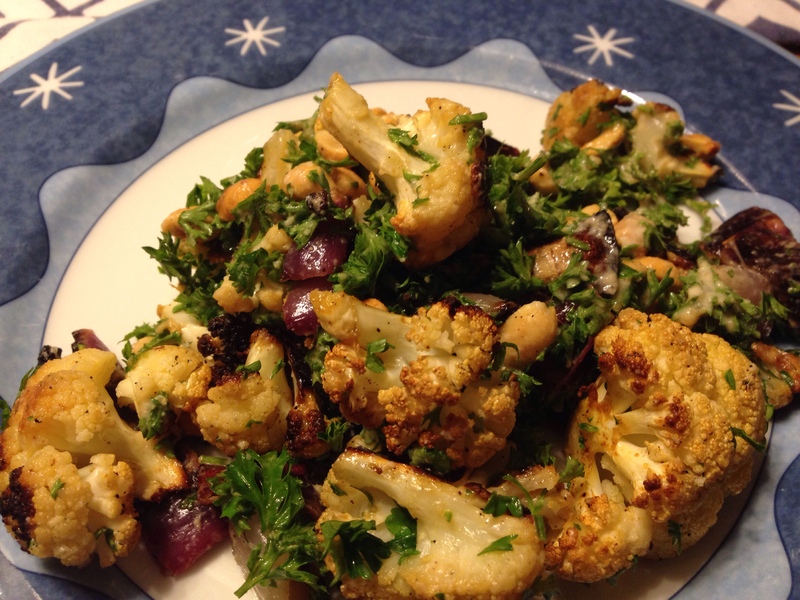 Scoop the roasted cauliflower and onions into a bowl, add the parsley and peanuts. Toss with the tahini mixture. Serve warm.